Look at the front cover illustration and title and have a class discussion about what the students know about floating and sinking. Make a list of things that they think float and sink. Have the students do a think-pair-share about what they think will sink the boat and why. The title is a question. How do you know it is a question? Why would the author make the title a question? Does it spoil the ending? What do you know about the size and weight of a cow and a donkey? Which would be more likely to sink the boat? Why? The book introduces new characters other than the cow and the donkey near the beginning of the book. Ask students to revise their predictions now that they can see all of the animals. Discuss who is the heaviest and who is the lightest. Stop each time Pamela Allen asks “Do you know who sank the boat?” and encourage students to revise their predictions after each animal hops in the boat. After reading Who Sank the Boat? for enjoyment, have a class discussion about their initial reaction to the story and their predications as to who sank the boat. Why do you think the lightest animal sank the boat? Do you think that the story would have ended differently if the animals had got into the boat in a different order? In pairs students make a boat out of plasticine that can float. Experiment to see which boat in the class can stay afloat holding the most marbles. It may take several attempts for students to create a successful boat. Which shape held the most marbles? You will need a large tub of water and a collection of different objects of various sizes and shapes that float and sink such as a cork, eraser, plasticine ball, marble, tennis ball. Have students sort the items into two piles: those that float and those that sink. Take a photo of their predictions. Now test all of the objects and adjust the two piles accordingly. Ask students to record their findings in the following observation table. I think these objects sink because . . . I think these objects float because . . .
Did the bigger objects float or sink? Why? What do the objects in each pile have in common? Look at the first two pages of the text. Ask what is unusual about the animals. Do a think-pair-share. What are you wondering about? Now look at the characters and the expressions on their faces as they make their way back to the farm (double page illustration at the end). How do you think each animal is feeling and why? Look at the mouse’s expression and how ask how the mouse’s expression is different from the rest. Make a copy of this illustration for each student and ask them to create a speech bubble or thought bubble for each animal, inferring what they might be thinking or saying to each other. Why do you think that they would think/say this? How did you know that this is how they might be feeling? What were the clues in the story and on their faces? Talk to the students about boating experiences that they might have had and discuss any safety precautions that they may have had to take before going on the boat. Make a list of all the safety equipment that they think should be on a boat. Marine and Safety websites have useful activities, information and video clips. See MAST (Tasmania). Relate this back to Who Sank the Boat? and have students draw and label a diagram about what it should have looked like for the animals to be having a safe boat trip. What did the animals do that was unsafe on the boat ride? What safety equipment should you have on a boat? Discuss the idea that this book was written to entertain. The ending was given away by telling us in the title that the boat was going to sink. Talk with the students about why Pamela Allen may have done this. Brainstorm some alternative titles for the book. Did knowing something about the ending before starting reading add to the entertainment? Were you guessing the culprit all the way through? Was it the words, the characters, the illustrations or the events of the story that made it entertaining? Was it all of these together? As a class talk about the structure and purpose of a review. Expose students to movie and book reviews and discuss how they can be useful. Brainstorm some vocabulary related to reactions to the book: fun, entertaining, suspenseful, humorous. 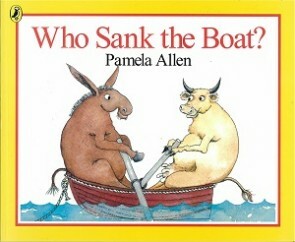 Have students complete a simple book review about Who Sank the Boat? Provide the template (PDF, 104KB) if required. Identify the beginning, complication and ending of Who Sank the Boat? Look at the ways the characters and setting are introduced through the illustrations and word choice. Draw students’ attention to the mouse being described as a “tiny little mouse” and the significance of this. Discuss how the drama is drawn out throughout the book and how the story is concluded. Create a story plan of Who Sank the Boat? using a story board (PDF, 95KB) to outline the beginning, middle and ending of the story. Why are they going for a row in the bay? Whose boat do you think it is? Draw the students’ attention to the pattern created throughout the book once the characters and setting have been established. Pamela Allen asks the same questions in the same format each time. Discuss how this contributes to the enjoyment of the reader. Is it easy to join in and read along with the teacher? Do you want to call out the answer to the question every time it is read? Why? How does the repetition of the question build the suspense? Almost every page, including the title, contains a question. Discuss the difference between a question and a statement. Have the class brainstorm words that indicate a question: who, what, when, how, why. Make a question word dice with ‘who, what, where, when, how and why’ on each face and play Beat the Teacher. Students take it in turns to roll the dice and ask the teacher a question about Who Sank the Boat? using the word they have rolled as a starting word. If the teacher answers the question correctly they can ask a student a question about Who Sank the Boat? and vice versa. The aim is for students to come up with a question about the book that the teacher cannot answer. To develop an understanding of how language works to represent what is happening in a story, look at the first page and discuss ‘who/what is involved’, ‘what is the action’ and ‘what are the circumstances’ and create a colour-coded sentence (red for identifying the participant, green for the process and blue for the circumstances). Then give out a range of the illustrations to the students to construct their own sentence to describe. For example, on page 7 where the cow is getting into the boat a student may write: The cow is sliding into the boat. Each time an animal gets into the boat Pamela Allen uses a different word to describe their action: tilted, balanced, stepped. Re-read the book and have students mime the way each animal gets into the boat, noticing how each one is slightly different. Create a list of all the words that they can think of to describe how the mouse got into the boat in addition to those given in the book. Put students into groups of 4–5 and give each group a large piece of paper. Allocate each group one of the animals from the story. Ask them to create a mind map of all the different verbs that can be associated with that animal. For example, with the mouse they could have ‘scamper, squeak or twitch’. Looking at the first and last page, the illustrations are almost identical. The setting is the same, but there are some subtle changes after the events of the day. Have students create a Venn diagram of the things that are the same and the things that are different in the beginning picture compared to the ending picture. Discuss how there was not enough room for all the animals to fit in the row boat without it sinking. Have students create a collage depicting what the animals could have done that day so that everyone could have safely had a row in the boat. Students then write a caption explaining their solution to the over-crowded boat. Why didn’t all the animals fit in the boat? What are some other ways that they all could have enjoyed the boat? Did everyone need to go in the boat at the same time? As a class explore and identify the beginning, complication and ending of a range of texts familiar to the class. Alternatively use some other Pamela Allen titles. Develop the understanding that many narratives have the same structure. As a class create a table showing the beginning, complication and ending of 3 or 4 of these stories to highlight the typical structure of a narrative. After exploring the structure of a narrative, have students create their own story on a blank story board (PDF, 95KB), clearly outlining the three phases of the story they might write. Some students may need some support with brainstorming ideas so as not to replicate something they have already seen in a book, in a computer game or on television. Duration 4 weeks with 3–4 lessons a week. JOS PULLEN is an experienced ECE classroom teacher at Bellerive Primary School in Tasmania. Jos has been a Literacy Lead Teacher and is actively involved in leading literacy professional learning at a school and system level. She has written for the National Literacy and Numeracy Week website and co-presented at the 2013 AATE/ALEA National Conference on exploring language to empower readers and writers.